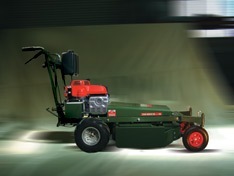 The H660 is a world class mower. We’ve engineered it to give continuous heavy duty service in all conditions whilst retaining the ability to give a smooth finish to parks and gardens when required. 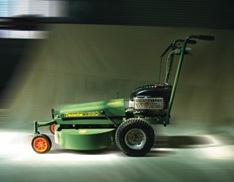 With over 50 years experience in manufacturing mowers, Deutscher have a reputation for strong reliable mowers. Just ask someone who has one! Wide 66cm (26”) cutting width. Strong steel cutting deck with 2.5mm walls and side discharge chute. Lever operated height adjustment - from 10mm - 88mm. Swivel front pneumatic wheels for easy manoeuvring - lockable for rough terrain or steep slopes. Large, wide rear wheels with tractor-tread tyres. Limited Slip Transmission is optional for extremely steep or harsh conditions. Hand clutch to engage and disengage driving wheels. Foot pedal to engage and disengage cutter drive. Large Capacity Fuel tank (6Ltr) - standard on all H660 mowers. * 56cm (22”) cutting width. * Two heavy duty blades attached to blade plate. Fluted to assist discharge of cut material. * Steel cutting deck with large side discharge chute. * Lever operated height adjustment - from 13mm - 70mm. * Swivel front wheels for easy turning. * Large rear wheels to handle rough terrain. * Heavy duty transaxle houses all driving gears (2 speed forward). * Hand clutch to engage and disengage driving wheels. * Hand lever engages the belt drive to the cutter. * 2 year limited warranty.